Nearly a million people who applied for sickness benefit have been found fit for work, according to figures from the Department for Work and Pensions. The DWP claims 980,400 people - 32% of new applicants for Employment and Support Allowance - were judged capable of work between 2008 and March 2013. The figure does not include those who successfully appeal against the ruling. Disability campaigners said the work tests were "ridiculously harsh and extremely unfair". A spokesman for Disability Rights UK said many of those passed fit will not, in fact, be capable of entering the workplace in any meaningful sense due to physical or mental health problems. "They are finding people fit for work when they aren't and they are not even giving them the support they need to get a job. It is a disgrace," he told BBC News. The DWP says appeals are upheld in 15% of its total "caseload" - and that it is often the result of new evidence being made available. But a report last year by the Public Accounts Committee found 38% of appeals were successful, a figure said was down to "poor decision making". 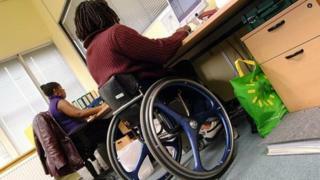 Work Capability Assessments were introduced in 2008 to determine who should receive ESA. Decisions are taken by officials at the Department of Work and Pensions using evidence from the assessments, carried out by private contractors such as Atos Healthcare. In 2010 the current government began phasing out incapacity benefit and requiring all claimants to be assessed before switching to ESA. The assessment aims to judge how a person's condition limits their ability to work, rather than conferring eligibility for benefits simply because of a certain impairment. Minister of State for Disabled People Mike Penning said: "As part of the government's long-term economic plan, it is only fair that we look at whether people can do some kind of work with the right support - rather than just writing them off on long-term sickness benefits, as has happened in the past. "With the right support, many people with an illness, health condition or disability can still fulfil their aspiration to get or stay in work, allowing them to provide for themselves and their family." The DWP says those who withdrew their claim after face-to-face interviews with officials either returned to work, recovered or claimed a benefit "more appropriate to their situation". It says a further 467,400 new ESA claimants were granted the benefit but assessed as being able to work in the future with targeted and extra support.